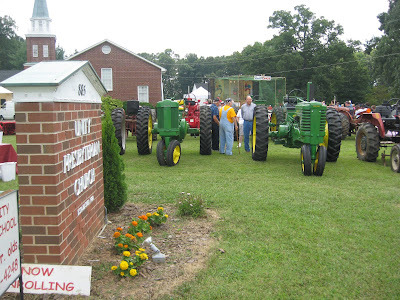 Today I went to the Woodleaf, North Carolina Tomato Festival at Unity Presbyterian Church. They've had the festival for quite a while now, but this is the first time I'd had a chance to go. They had tomato sandwiches (of course). Sadly, I am one Southern girl who does not like tomato sandwiches. One year, my Dad had a bumper crop of tomatoes. 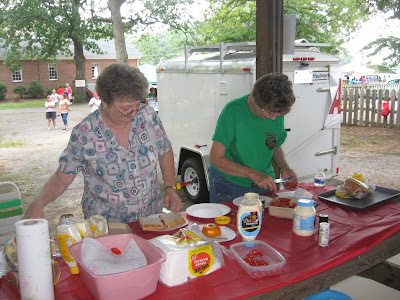 Mom declared that we would eat tomato sandwiches all summer and made us all big, drippy tomato sandwiches slathered with mayonnaise. If there's one thing I like less than tomato sandwiches, it's tomato sandwiches with mayo. The bread gets all soggy which I think is my main problem. I did the logical thing and buried my sandwich under the pecan tree. The next year, Mom was trying to figure out why a tomato plant grew under the pecan tree. I think that was God's way of telling me something, but I never did get a taste for tomato sandwiches. But, I will eat tomatoes plain or on burgers or something. 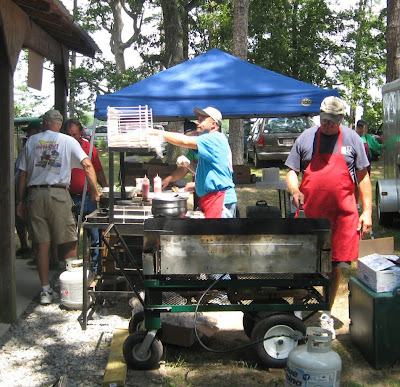 Lucky for me, they had grilled burgers and hot dogs at the festival. They were cranking those out with the help of College Barbecue of Salisbury, NC which is one of my favorite places to eat especially for breakfast. 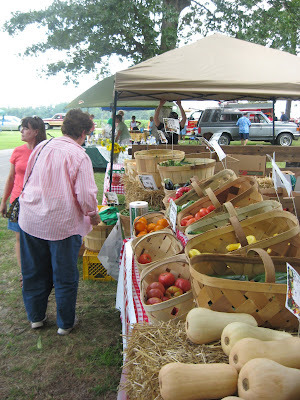 At the festival, they had fresh produce from Wetmore Farm and also some homemade jams and jellies. I was wanting to get some sweet potato butter, but Carol hadn't made any up yet. So, I'll have to wait on that. I've only had apple butter, so I'm looking forward to trying the sweet potato butter which another lady told me tastes like sweet potato pie. 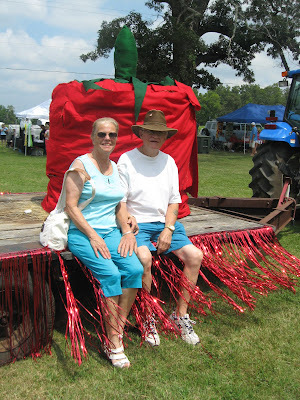 The Woodleaf Tomato Festival is a small town festival, and I really do mean small town. You head out Woodleaf-Barber Road and then they have some parking in a field near the church. In addition to the food, they have entertainment, crafts, play areas for the kids, and a yard sale.